eGain Offers™ helps businesses engage visitors on the company website and Facebook fan pages with proactive, targeted offers. Using browsing behavior and other attributes, the solution anticipates visitor need and proactively serves a targeted offer. It leapfrogs existing proactive chat “point” solutions by providing coupons, promotions, surveys, personalized content as well as contextual help in the form of FAQ, chatbot, chat, click to call, and cobrowse options. What’s more, all this flexibility comes in a solution that is easy to deploy and optimize. Deployment is as simple as adding a tag to the website code, while A/B testing tools and analytics ensure the best results. 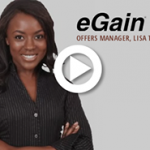 Built on the award-winning eGain Customer Engagement Hub™, eGain Offers is organically omnichannel. As part of the eGain Solve suite, it integrates seamlessly with other eGain applications to enable unified offer management across communication channels and consumer lifecycle.